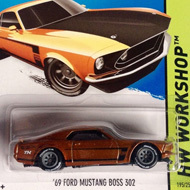 188/250 is part of the HW Workshop series series and the 2015 Super Treasure Hunt set. 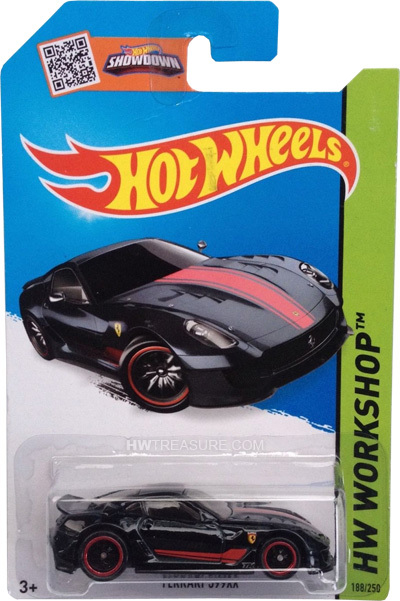 The Spectraflame black car features “TH” on the sides and boasts red stripes and the Ferrari logo on the hood and sides. It has tinted windows, black interior, black 10-spoke Real Rider wheels with red rims, and a black plastic Malaysia base. The Ferrari 599XX made its debut in the 2010 Speed Machines. It is based upon the 720 horsepower track-only version of the 599 GTB Fiorano. 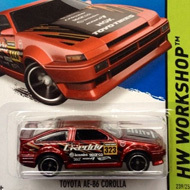 This is its second appearance as a T-Hunt and was previously in the 2012 Super set.